"Okay, it's about this guy, who's not who he says he is, who everybody thinks he is, who fools these guys who thinks he is, falls in love with this girl who thinks he is, even though he isn't, and they try to pull a heist with his expertise, even though he has none." Nick (Ben Affleck) has just been released from jail for defending his girlfriend in a fight prior to being thrown into the slammer. Upon his release, a long-time pen pal named Ashley (Charlize Theron) greets him and they immediately hit the sack. However, her brother (Gary Sinise) wants Nick to help them pull a heist on Christmas Eve at a local Indian casino, which is run by a money hungry wannabe (Dennis Farina). Her brother kidnaps Nick, holds a gun to his head and commands him to draw up a sketch of the security points in the casino, since he used to work there and knows all there is to know about the casino. There is one minor detail, however, that may hinder their plan. Nick is really a car jacker who overheard his jail cellmate, Nick, reading his letters from a penpal named Ashley aloud. Nick was killed before his release in the jail cafeteria, and so Nick took his identity so that he could meet up with the infamous Ashley he kept hearing about, forming a mental picture of her in his head. If you stop to take the time and think through all the minor details of the film's plot (especially given the "twist" ending), you'll probably arive upon the conclusion that it's all a bunch of bull. It simply doesn't make sense if you really take the time to think it through. If you don't put your brain to work, however, you'll find yourself having fun watching director John Frankenheimer's last film. Frankenheimer was a talented director, the man behind such films as "The Manchurian Candidate," "Seconds" and "Ronin." His last feature was one of his most stylish and brutal, fast-paced, funny, and often just fun to sit through. Gary Sinise ("Forrest Gump," "Ransom") is his usual villainious self, while the real surprise comes from actress Charlize Theron, who switches character a lot through the film, especially towards the end, and is a real beauty and delight to watch. She's the film's high point, and though people criticize the plot, I found "Reindeer Games" mildly inventive with its shifting twists and turns, even if they aren't always so believable. The film's downfall is its ending, which feels as if the filmmakers got caught up in all their twists and turns and unconsciously wrote themselves into a wall, then suddenly slapped on a cheesy, cliched ending with a sentimental good guy closing scene. It's rushed, silly, and doesn't fit in with the rest of the film. 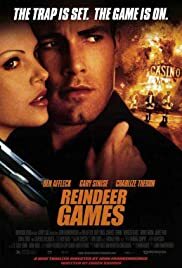 Irregardless of its uncountable flaws, "Reindeer Games" (or "Deception" as it is called in the UK) is a fun film, John Frankenheimer's final movie. "Reindeer Games" is often linked as Frankenheimer's long-time dream picture, much like Sergio Leone's "Once Upon a Time in America." Like a dying man's final words, perhaps it conveyed some hidden meaning to Frankenheimer. Or, maybe everyone was wrong. Maybe "Reindeer Games" is nothing but another Frankenheimer film, this one not as good as most of his others. But "Rosebud" didn't mean anything to anyone except Charles Foster Kane. Maybe "Reindeer Games" meant something to John Frankenheimer. However, as anyone who has ever seen "Citizen Kane" probably knows, it's not likely that we'll ever find out what it means, even if we try. 3/5 stars. Enjoyable if you don't put your brain to work.